3-6Jesus knew that the Father had put him in complete charge of everything, that he came from God and was on his way back to God. So he got up from the supper table, set aside his robe, and put on an apron. Then he poured water into a basin and began to wash the feet of the disciples, drying them with his apron. When he got to Simon Peter, Peter said, "Master, you wash my feet?" 7Jesus answered, "You don't understand now what I'm doing, but it will be clear enough to you later." 8Peter persisted, "You're not going to wash my feet—ever!" Jesus said, "If I don't wash you, you can't be part of what I'm doing." 9"Master!" said Peter. "Not only my feet, then. Wash my hands! Wash my head!" 10-12Jesus said, "If you've had a bath in the morning, you only need your feet washed now and you're clean from head to toe. My concern, you understand, is holiness, not hygiene. So now you're clean. But not every one of you." (He knew who was betraying him. That's why he said, "Not every one of you.") After he had finished washing their feet, he took his robe, put it back on, and went back to his place at the table. 12-17Then he said, "Do you understand what I have done to you? You address me as 'Teacher' and 'Master,' and rightly so. That is what I am. So if I, the Master and Teacher, washed your feet, you must now wash each other's feet. I've laid down a pattern for you. What I've done, you do. I'm only pointing out the obvious. A servant is not ranked above his master; an employee doesn't give orders to the employer. If you understand what I'm telling you, act like it—and live a blessed life. Jesus had taken Simon Peter from his unglamorous background and elevated him, chosen him to be one of his disciples, and now Jesus, as he was in the habit of doing, turned things on their head. Jesus becomes a servant and in turn asks them to do the same. It is interesting that he washes their feet. When he first met them he called them with the words "Follow me". The dust, dirt, blisters and callouses that he now bathed had been gained because they had put one foot in front of the other and followed him. So now he prepared them for their journey, by his example he showed them the way, servanthood. He prepared them to follow him even though he knew he must soon leave them. He cleansed, anointed if you like, their feet to follow him through the journey ahead. So what shape are our feet in? probably pretty good most of us, maybe a little worse for wear from a bad choice of shoes? Maybe we believe with our minds, our hearts even. we may work and give with our hands, but are we prepared to follow him? This holy week, Are we prepared to put one foot infront of the other and follow him through the darkness that lies ahead. 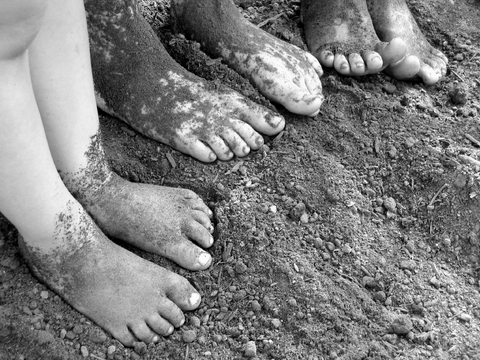 Do our feet carry the dust disturbed by Jesus?